Hopefully, you don't run into any problems like that when you're in this costume, and just have tons of fun instead! 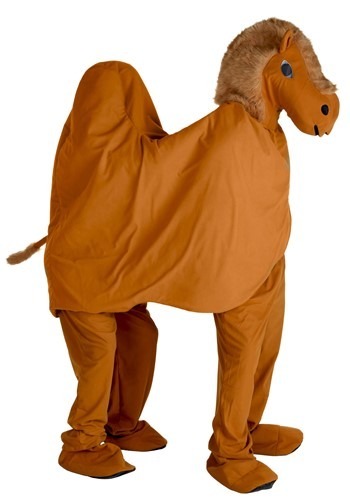 We designed it to be easy to put on, since it's simply two pairs of camel-colored pants with some matching shoe covers, and a matching canopy that goes over the both of you, with a tail on one end and a hole for the plush camel mask to go through on the other. Now, you just have to decide who's "heads" and who's "tails" and then it's party time!